Definition at line 664 of file ws2def.h. Definition at line 671 of file ws2def.h. Referenced by freeaddrinfo(), getclnthandle(), InternetTransport_Connect(), reverse_lookup(), rpcrt4_ip_tcp_get_top_of_tower(), rpcrt4_ncacn_ip_tcp_open(), rpcrt4_protseq_ncacn_ip_tcp_open_endpoint(), WspiapiClone(), WspiapiLegacyFreeAddrInfo(), and WspiapiNewAddrInfo(). Definition at line 669 of file ws2def.h. Referenced by getclnthandle(), InternetTransport_Connect(), reverse_lookup(), rpcrt4_ncacn_ip_tcp_open(), rpcrt4_protseq_ncacn_ip_tcp_open_endpoint(), and WspiapiNewAddrInfo(). Definition at line 670 of file ws2def.h. Referenced by freeaddrinfo(), and WspiapiLegacyFreeAddrInfo(). Definition at line 666 of file ws2def.h. 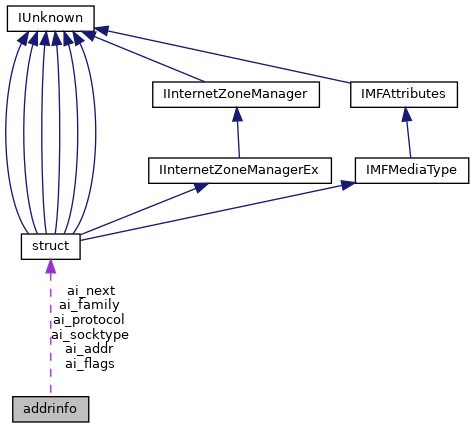 Referenced by build_wpad_url(), InternetTransport_Connect(), rpcrt4_ip_tcp_get_top_of_tower(), rpcrt4_ncacn_ip_tcp_open(), rpcrt4_protseq_ncacn_ip_tcp_open_endpoint(), TestNodeName(), TestServiceName(), and WspiapiNewAddrInfo(). Definition at line 665 of file ws2def.h. Definition at line 672 of file ws2def.h. Referenced by build_wpad_url(), freeaddrinfo(), getclnthandle(), InternetTransport_Connect(), rpcrt4_ncacn_ip_tcp_open(), rpcrt4_protseq_ncacn_ip_tcp_open_endpoint(), WspiapiClone(), and WspiapiLegacyFreeAddrInfo(). Definition at line 668 of file ws2def.h. Referenced by InternetTransport_Connect(), rpcrt4_ncacn_ip_tcp_open(), rpcrt4_protseq_ncacn_ip_tcp_open_endpoint(), WspiapiClone(), and WspiapiNewAddrInfo(). Definition at line 667 of file ws2def.h. Referenced by InternetTransport_Connect(), rpcrt4_ncacn_ip_tcp_open(), rpcrt4_protseq_ncacn_ip_tcp_open_endpoint(), and WspiapiNewAddrInfo().